Thank you for expressing an interest in Threshold Passages, Inc. (TPI), which provides programs for youth 7-17 years old called Journey to Manhood and Journey to Womanhood. Boys 7-12 years old can join the Adventure Group for Boys along with parents. Mothers with daughters 7-12 years old can attend the Girls Group. 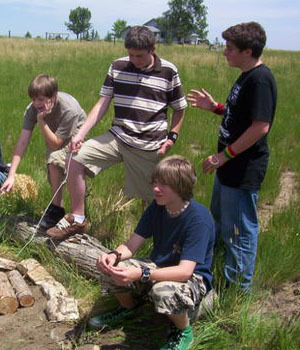 Teenage boys 12-17 years old are invited to attend the JourneyMan Group. A group for teenage girls 12-17 years old is under development. Boys 7-12 years old can join the Adventure Group for Boys, a safe group for boys with an adventure theme. We’ll have fun and make better connections with peers, parents and mentors. Every boy is an adventurer at heart. Everyone has an adventure to share. Teenage boys 12-17 years old can join the JourneyMan Group for support on their journey to manhood. This group is a safe place to voice the truth without judgment, experience and express man-sized feelings, and discover one’s own form of leadership. Everyone is affirmed for the unique gifts that we bring to the world. As demand supports it, J2M offers the Rites of Passage Adventure Weekend (RPAW). During this weekend experience, that takes place in the Colorado mountains, positive qualities such as integrity, courage, respect, passion, and leadership are modeled by the adult male staff. Through a series of carefully facilitated processes, each teenage boy is challenged to take the steps needed to become the man he wants to be. It is a fun and life-changing experience that many say they will never forget. We are currently seeking a new Program director/coordinator. Please let us know you are interested using the contact page. What is the Adventure Group for Boys? We’re a group of boys and parents that like to go on adventures together. Hiking, climbing, fishing, laser tag, digging, swimming and exploring. You name it and we’ll try it. We’ve been all around Denver – in the mountains, to the museum, etc. Where do you want to go? The group is for dads and sons to have fun together, but we know that not every boy can bring a dad. So moms are welcome to bring their boys. Uncles and grandfathers too. If you have an adult brother, sister or cousin they can come. An adult mentor can come with you as well. Let us know, because some permission slips might be needed. What about my little sister? This group is for boys. We have another group for girls. What about my little brother? If he’s 7 years old or more then he can come. If he’s younger, we’ll need to talk to your parents about that. What about my big brother who’s not grown up yet? We’d love to meet him, but there another group for older boys that might be better. That depends. Usually we ask for a donation of $5/person if we’re doing something that doesn’t cost anything, like hiking at a park. If we do something more expensive, like indoor climbing, we’ll drop the suggested donation so families can pay the activity fee to the facility. Sometimes we’ll get a group rate, if we have enough people coming, and J2M will pick up the cost and ask for donations to cover expenses. What is the Girls Group? We’re a group of girls and mothers that like to get together to learn and have fun. We do stuff like play games, tell stories, learn skills and have fun. Making soap, baking, identifying wild herbs and starting a fire are a few of the things we’ve learned. The group is for moms and daughters to have fun together, but we know that not every girl can bring a mom. So female guardians are welcome to bring you. Aunts and grandmothers too. If you have an adult sister or female cousin they can come. An adult female mentor can come with you as well. Let us know, because some permission slips might be needed. The group is for ladies only. Your dad can bring you, but he can’t be in the group. It’s better if you have a female adult with you, but if you can’t do that, then let us know and we’ll work something out. This group is for girls. We have other groups for boys. If she’s 7 years old or more then she can come. If she’s younger, we’ll need to talk to your parents about that. What about my big sister who’s not grown up yet? We’d love to meet her, but we’re working on another group for older girls that might be better. We ask for a donation of $3/girl and $5/adult. For anyone who is invested in the welfare of our youth, TPI offers the opportunity to contribute deeply and meaningfully to their lives and is a rich and powerful avenue for personal development. Please note that it cannot be stressed enough that, at this initial stage, volunteer resources are the source of this organization's ultimate success. We can put financial contributions to good use as well, but a strong group of individuals will be worth their weight in gold. If you are interested in serving as a Mentor, please contact us . All Mentors are required to submit to state and national level background checks. Download the Mandatory Background process form to start the process. This is a measure taken to keep our program safe. We screen for child abuse/endangerment and other highly pertinent criminal history. and our J2W Program for teen girls. Donations are the lifeline of our program. We accept payments via check, credit card or Paypal.